The Asia and the Pacific region contains some of the world’s most powerful economies and the 21st Century is often touted to belong to this region. Yet the region is home to 66% of the world’s poorest poor. 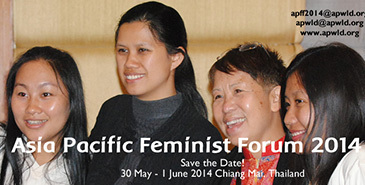 Denouncing such stark disparities, the 1st plenary session at the 2nd Asia Pacific Feminist Forum (APFF 2014) currently being held in Chiang Mai, Thailand, focussed upon ‘Feminist Visions—framing strategies, analysis and resistances in the current political, economic and social movement’. The speakers, as well as the audience, reiterated the need for a new development framework based upon development justice model (as opposed to the corporate model) that includes economic justice, social justice, environmental justice and accountability to people. She exhorted that to chart our common strategies and the way forward in solidarity with each other. Judy M Taguiwalo, Chairperson Committee on Women Alliance of Concerned Teachers, Philippines appealed for resisting the neo-liberal hijack of feminism. She insisted upon harnessing women’s energies to remove glaring economic and social inequalities by promoting the type of feminism in which gender emancipation goes hand in hand with participatory democracy and social solidarity. Redistribution remains the key plank of this feminism which is very much wedded to the people’s movement that is both economic and political. However while creating waves and fostering movements, it is important to clarify economic, political and social context of the region and how women respond collectively to such context. She said that, “We must say no to Privatization; say no Discrimination on the bases of class, gender, or disability; say yes to Peace instead of war and militarization; and insist upon Inclusive growth and development”. In the opinion of Tin Tinyo, General Secretary, Women’s League of Burma, “feminism is a collection of ideologies and movements aimed at defining and defending equal political, economic, cultural and social rights for women. The focus of feminists’ movements should be to influence decisions on matters concerning women (including building sustainable peace) through greater participation of women in political decision making processes, economic empowerment and increasing access to natural resources. There should be zero tolerance for all forms of violence”. Rizwana Hassan, an environmentalist from Bangladesh (whose speech was read in absentia) spoke to Citizen News Service (CNS) about the struggle for environmental justice in Bangladesh where 60% of the population earns their living from agriculture, while millions depend on the forest for their livelihood. Degradation of the environment has direct implication for the commoners whose lives are inextricably linked with nature and natural resources. Women are especially vulnerable to such degradation as their access gets further limited and their ability to cope with alternative choices is less. The core values of the women’s movement in Bangladesh include upholding community ownership and management of natural resources in a just, equitable and gender sensitive way. This runs contrary to the core objective of commercialization through the ongoing exploitative mode of resource utilization. The strategies include legal assistance, awareness raising, community mobilization, and networking both at national and global level.